When the commentators on ESPN describe our women’s World Cup team, they talk about “grit” and “heart.” Of course, any ESPN listener understands that these words are code. What they are really saying is, the U.S. keeps winning, and stands poised to tally its third title on Sunday, despite being not that great. The particular iteration is weaker than the Mia Hamm era teams. They barely qualified for this tournament and have rarely looked like the world’s best. They are unable to maintain possession for extended periods of time because they lack great ball handlers, and many of our players have a dubious first touch. Where our more skilled French and Brazilian opponents have attacked with finesse and flair, we have tended to chart a very direct, highly utilitarian path to the goal. There’s no doubt that you can attribute their success, therefore, to pluck—and, indeed, that quality makes this team so darn likable. But that’s a fairly superficial explanation. In actuality, the United States simply spends more money and devotes greater attention to women’s soccer than any country in the world. As a result, our program attracts better athletes, who are tuned to attain a higher level of fitness. Because they train and play together so often, they have a terrific chemistry, a palpable sense of cohesion. In short, the United States owes its success to its commitment to gender equality in soccer—a commitment that stands us in stark contrast to most of the world, even the Western world. Or take England, where the sport’s governing body officially banned women from playing in its stadia until 1971. When the English reached the quarterfinals of this year’s tournament, the BBC initially declined to broadcast the game. (A swirl of outrage ultimately forced the Beeb’s hand.) It’s hard to generate widespread enthusiasm, and more importantly participation, when the media treat the game with so much condescension. Of course, our female athletes don’t outpace the rest of the world in every sport. But soccer is a special case. The game is so deeply entangled with male identity that it remains stubbornly unwelcoming to women, even in countries that should know better. Title IX has also played an important role in creating teams and competition that have provided a uniquely great training ground in the U.S., especially given the paucity of competitive women’s leagues in the world. It’s worth briefly pausing to give credit to ESPN. American media, on the whole, have done a poor job of covering women’s sports—and this tournament in particular. During the group phase, only three reporters trailed the American team. Despite their colleagues’ lack of interest in the competition, however, ESPN has thrown plenty of resources into giving the event the attention it deserves. (After the triumph over Brazil, you couldn’t go 30 seconds on Sports Center without a glowing allusion to Abby Wambach’s heroics.) That will pay substantial dividends for the national program—ESPN has a unique capacity for creating enthusiasm for a sport from whole cloth. So, if the American advantage in the women’s game is somewhat artificial, based on our greater investment, who cares? We have a legitimately jingoistic rationale for embracing our team. That is, our national women’s soccer program is the direct result of the more enlightened policy choices our country has made. Sure, chauvinism remains a major barrier to the game’s popularity in this country. But the performance of this team has no doubt eroded some of that. 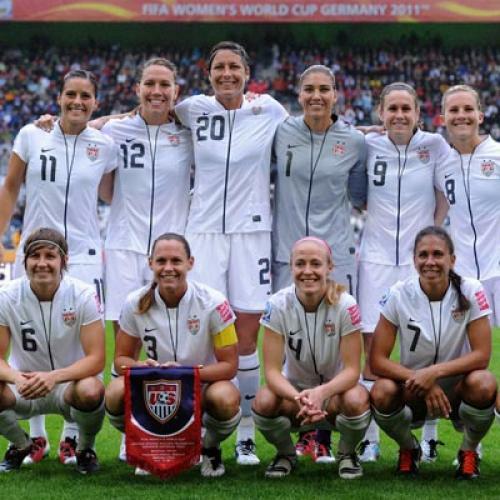 Even if these women don’t bring the most beautiful game, they represent our country’s highest ideals. Franklin Foer is an editor-at-large for The New Republic.